Word of mouth travels fast and the reputation of your business can be affected by the quality in customer experience. How much do you know about the relationship between your customers and your organisation? A customer experience strategy is essential. Customer expectations are continually rising, and faster than the speed that companies can adapt their methodologies to improve their customer experience. It’s quite apparent that customers expect every interaction to be the best experience they can have with any company. So, we ask the question… How can your organisation create a great customer experience? At Acceler8 Consultancy, we’ve created 7 Steps to Customer Advocacy © that can help deliver the right customer experience for your organisation. 1) Listen to what customers are saying. The first step in your customer experience strategy is to have a clear customer-focused vision that you can communicate with your organisation. To understand this vision, you need to listen to what your customers are saying so you can implement an effective strategy. 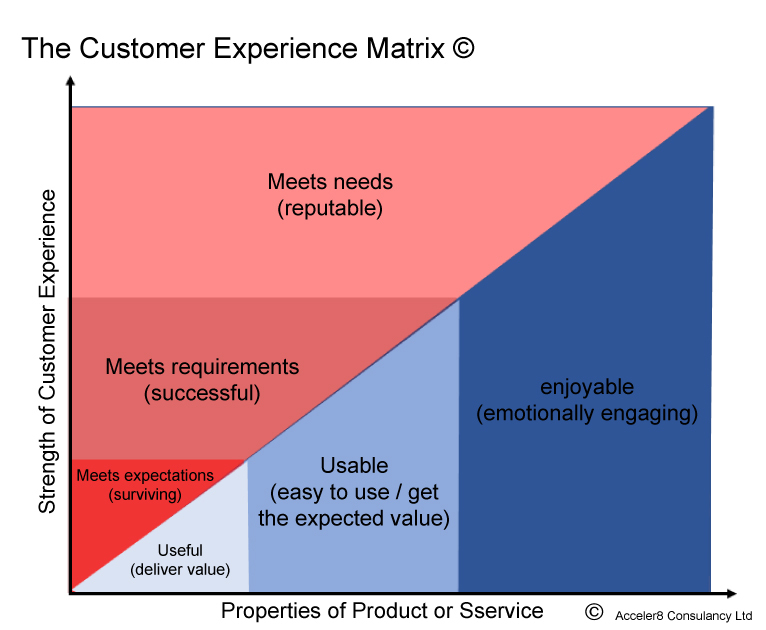 2) Decide where your company wants to be positioned on Customer Experience Matrix ©. By understanding who your customers are and the different personas that people within your organisation have to deal with, will allow you to position yourself accordingly on the Customer Experience Matrix ©. 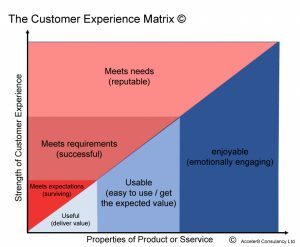 This matrix takes into consideration the properties of service/product and measures it against the level of interactivity from the customer. The positioning on this matrix will reflect the level of interaction required from your organisation with your customers depending on the overall value of the product/service. 3) Be creative with what that means. The best customer experiences are achieved when a member of your team creates an emotional connection with a customer – “it’s not what you say; it’s how you say it”. Customers become loyal because they are emotionally attached and they remember how they feel when they use a product or service. 4) Design what the customer experience actually looks like through ALL interactions. Do you know what you want your customer experience to look like? Have you considered all the touchpoints that customers have with your business? Are your staff trained sufficiently to ensure the customer experience excels? Many organisations assess the quality of phone and email communications as key touchpoints between staff and customers, however, a quality framework takes this assessment one step further by scheduling and tracking your teams development through coaching, eLearning and group training. 5) Pilot. Now you’ve established what you want the customer experience to look like, it’s time to test it. There’s no point in rolling out a full communication strategy and training plan if your approach hasn’t been tried and tested with your customers. Consider piloting your new strategy with one area of the business and ensure you capture feedback in real time. Post-interaction surveys and similar customer experience tools can be delivered using a variety of automated tools through email and calls. You might even want to make outbound calls to customers in order to gain more insightful feedback. 6) Implement. Once your new strategy has been tried and tested, and you know it’s having a positive effect on business outputs, it’s time to role it out to the rest of the company. Have your communication strategy ready to ensure employees understand the business reason for any changes you are implementing and get them on board with the new approach. 7) Measure and improve. So, you’ve done all the work and invested into relevant training for your staff and implemented communication strategies to enhance your customer experience, but how do you know if this investment has had any effect and actually paying off? The answer is in the business results and whether you’re seeing an increase in sales / service delivery. NPS is considered as a suitable benchmark for a customer experience metric because a lot of companies use it as the standard customer experience measurement. Want to know more on how you can improve your customer experience strategy? We’d love to discuss recent successes with you and how these could be implemented within your own business so contact us today.